#10-32 x 3/8 black cap screws with lock washers (2 of each per set). Used on later-model Bally, Chicago Gaming, Gottlieb, and Williams games. 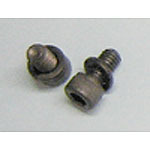 Can also be used on Bally / Midway games from mid-1980s and possible other makes/models as well that require #10-32 screw. Cap screws use an Allen wrench or driver bit, 5/32-inch size. Bally and Williams games use 2 screws/washers per coil stop. Gottlieb games use 3 screws/washers per coil stop. Cap screw replaces Bally / Williams # 4010-01066-06 and Gottlieb # FA-90. Lock washer replaces Bally / Williams # 4701-00004-00 and Gottlieb # FA-634. Replace anytime you rebuild your flippers or replace the coil stop. Use with threadlocker compound to keep screws from working loose.